Lot 701. Severus Alexander. A.D. 222-235. AR denarius (18 mm, 3.35 g, 6 h). Rome, A.D. 226. 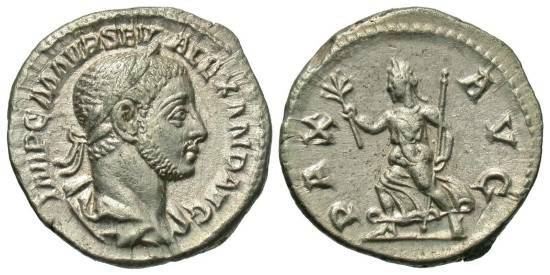 IMP C M AVR SEV ALEXAND AVG, laureate and draped bust of Severus Alexander right / PAX AVG, Pax advancing left, holding branch and scepter. RIC 168; RSC 187. High relief portrait. Nearly extremely fine.